FRONTLINE Plus offers the long-lasting, most complete flea and tick control available, killing up to 100% of fleas on your pet within 18 hours and up to 100% of ticks on your pet within 48 hours. Best of all, research confirms that FRONTLINE products work for an entire month to help keep your pet flea-free. For cats or kittens 8 weeks or older. FRONTLINE Plus offers the long-lasting, most complete flea and tick control available, killing up to 100% of fleas on your pet within 18 hours and up to 100% of ticks on your pet within 48 hours. Best of all, research confirms that FRONTLINE products work for an entire month to help keep your pet flea-free. For dogs and puppies, six weeks and older, weighing 23-44 pounds. FRONTLINE Plus offers the long-lasting, most complete flea and tick control available, killing up to 100% of fleas on your pet within 18 hours and up to 100% of ticks on your pet within 48 hours. Best of all, research confirms that FRONTLINE products work for an entire month to help keep your pet flea-free. For dogs weighing 45-88 pounds. FRONTLINE Plus offers the long-lasting, most complete flea and tick control available, killing up to 100% of fleas on your pet within 18 hours and up to 100% of ticks on your pet within 48 hours. Best of all, research confirms that FRONTLINE products work for an entire month to help keep your pet flea-free. For dogs weighing 89-132 pounds. FRONTLINE Plus offers the long-lasting, most complete flea and tick control available, killing up to 100% of fleas on your pet within 18 hours and up to 100% of ticks on your pet within 48 hours. Best of all, research confirms that FRONTLINE products work for an entire month to help keep your pet flea-free. For dogs and puppies, six weeks and older, weighing 1-22 pounds. 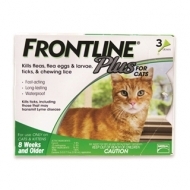 Get rid of fleas and ticks fast with Frontline Plus for Cats 3-Dose. This long-lasting, powerful formula offers the most complete flea and tick control available. Frontline Plus works quickly to kill adult fleas and ticks, flea eggs and larvae and will continue to provide protection for a full month after application. For cats or kittens eight weeks or older. 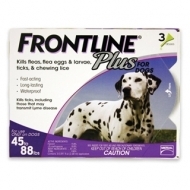 Get rid of fleas and ticks fast with Frontline Plus For Dogs up 45-88 lbs. This long-lasting, powerful formula offers the most complete flea and tick control available. Frontline Plus works quickly to kill adult fleas and ticks, flea eggs and larvae and will continue to provide protection for a full month after application. For dogs and puppies eight weeks and older, weighing up 45-88 lbs. Bayer K9 Advantix II Flea Treatment is a once-a-month, topical application for extra large dogs and puppies at least 7 weeks of age and weighing over 55lb. It both kills and repels fleas, ticks, mosquitoes, biting flies and lice. 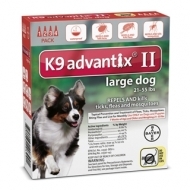 K9 Advantix II contains imidacloprid, permethrin and pyriproxyfen that work together to repel and kill parasites that can potentially transmit disease-causing organisms to your dog. This waterproof formula is designed to kill all life stages of fleas and prevents the development of flea eggs, larvae and pupae within 12 hours. Package contains 4 monthly applications. 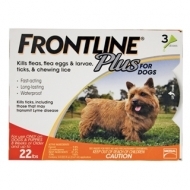 Get rid of fleas and ticks fast with Frontline Plus For Dogs up to 22 lbs. This long-lasting, powerful formula offers the most complete flea and tick control available. Frontline Plus works quickly to kill adult fleas and ticks, flea eggs and larvae and will continue to provide protection for a full month after application. For dogs and puppies eight weeks and older, weighing up to 22 lbs. Bayer K9 Advantix II Flea Treatment is a once-a-month, topical application for large dogs and puppies at least 7 weeks of age and weighing between 21-55lb. It both kills and repels fleas, ticks, mosquitoes, biting flies and lice. 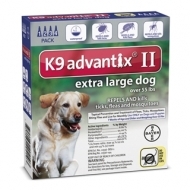 K9 Advantix II contains imidacloprid, permethrin and pyriproxyfen that work together to repel and kill parasites that can potentially transmit disease-causing organisms to your dog. This waterproof formula is designed to kill all life stages of fleas and prevents the development of flea eggs, larvae and pupae within 12 hours. Package contains 4 monthly applications. Get fast flea relief for your pet with Bayer Advantage II Flea Treatment for Large Cats. The treatment kills fleas in all stages of life starting within the first hour. Designed to kill 98-100% of all existing fleas within 12 hours of initial application and help prevent future infestations on your cat. 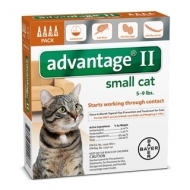 Formulated to treat only cats 8 weeks or older and weighing over 9lb once a month. Contains four monthly treatments. 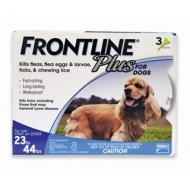 Get rid of fleas and ticks fast with Frontline Plus For Dogs up 23-44 lbs. This long-lasting, powerful formula offers the most complete flea and tick control available. Frontline Plus works quickly to kill adult fleas and ticks, flea eggs and larvae and will continue to provide protection for a full month after application. For dogs and puppies eight weeks and older, weighing up 23-44 lbs. Bayer K9 Advantix II Flea Treatment is a once-a-month, topical application for medium dogs and puppies at least 7 weeks of age and weighing between 11-20lb. It both kills and repels fleas, ticks, mosquitoes, biting flies and lice. K9 Advantix II contains imidacloprid, permethrin and pyriproxyfen that work together to repel and kill parasites that can potentially transmit disease-causing organisms to your dog. This waterproof formula is designed to kill all life stages of fleas and prevents the development of flea eggs, larvae and pupae within 12 hours. Package contains 4 monthly applications. 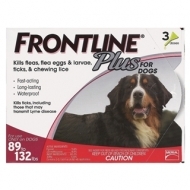 Get rid of fleas and ticks fast with Frontline Plus For Dogs 89 -132 lbs. This long-lasting, powerful formula offers the most complete flea and tick control available. Frontline Plus works quickly to kill fleas of all life stages and multiple species of ticks, including those that could transmit Lyme disease. Frontline Plus will continue to provide protection for a full month after application. This 3 dose pack is ideal for dogs and puppies 8 weeks and older, weighing 89-132 lbs. Get fast flea relief for your cat with Advantage II Flea Treatment for Small Cats, killing fleas in all stages of life starting within the first hour. Advantage II kills 98-100% of all existing fleas within 12 hours of initial application and helps prevent future infestations on your cat. Formulated to treat cats 5-9 lbs. 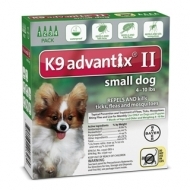 Bayer K9 Advantix II Flea Treatment is a once-a-month, topical application for small dogs and puppies at least 7 weeks of age and weighing 10lb and under. It both kills and repels fleas, ticks, mosquitoes, biting flies and lice. 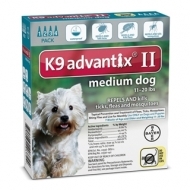 K9 Advantix II contains imidacloprid, permethrin and pyriproxyfen that work together to repel and kill parasites that can potentially transmit disease-causing organisms to your dog. This waterproof formula is designed to kill all life stages of fleas and prevents the development of flea eggs, larvae and pupae within 12 hours. Package contains 4 monthly applications.